Electrical safety. Low ripple. No amplifier hum, or noise caused by ground loops, or inductively and/or capacitively coupled rectifier pulsations. Manage heat and/or prevent expensive component damage from thermal runaway, or a catastrophic parts or design failure. 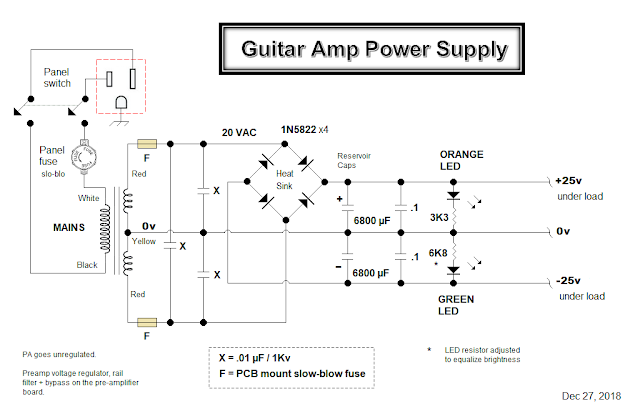 I’ll show my pursuit of a split DC supply for a jazz guitar amplifier [ ~22-24 Watts into an 8 Ω load ]. 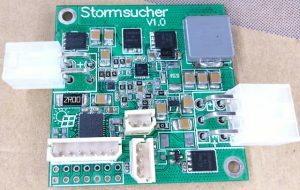 I learned a ton making this power supply, and, of course, this knowledge will boost the success of obtaining the above 4 goals in future designs. In 2018, I bought 2 suitable iron transformers: a toroidal + conventional frame type. 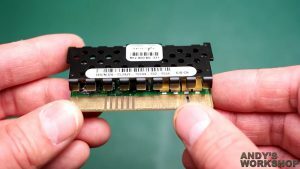 Likely, the transformer is the most important plus costly object in your whole amplifier build. This blog will lean towards low power clean jazz guitar amps, however, all the same principles apply for higher power guitar amps. I show how I measure my amplifier power ratings near the bottom of this blog page. Above 2 photos — My 2 transformers. I purchased the “Torel” toroidal unit on eBay from hansurmann from the Russian Federation. I purchased the Hammond ‘heavy weight’ locally & mainly because I got a very good deal on it. The heavy Hammond transformer will either go in a lab power supply, or perhaps a combo amp that never leaves the lab. 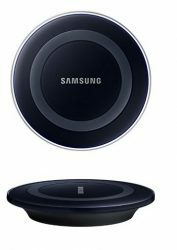 It’s a well built transformer that offers separate bobbins for the 2 windings eliminating the need for an electrostatic shield between the primary and secondary coils. 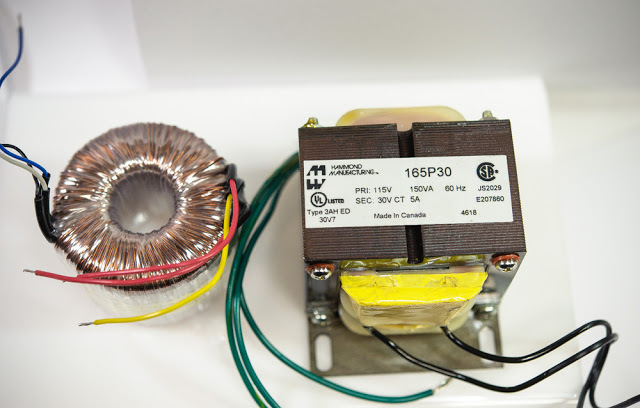 Hammond Manufacturing also offers a good selection of Toroidal transformers to view and to learn more about them. Transformer power rating isn’t usually expressed in Watts; rather VA (Volts [RMS] and Ampere units). So my Hammond center-tapped transformer as shown is 30 VAC * 5 Amps = 150VA. This would work very well for a 4 ohm load guitar amp. 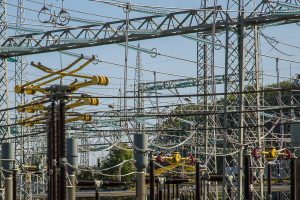 Your transformer’s secondary AC voltage and rectified DC voltage varies with the diode type + rectifier topology, how you filter the pulsating DC into low-ripple DC voltage — and the load on the power supply . 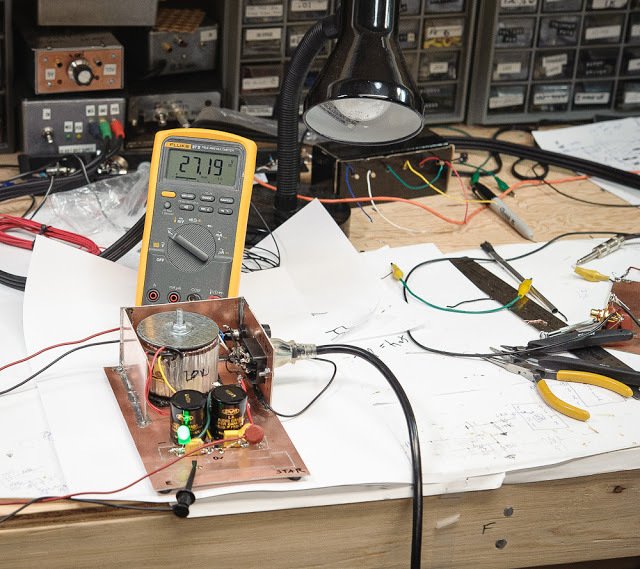 If you seek to make a ‘specific’ wattage guitar amp, this makes choosing your transformer output AC voltages a little more difficult than you might like. For a ~22 Watt 8 Ω jazz guitar amp. You’ll roughly need +/- 23 to 24 volts on your power amp stage DC rails (under heavy load) to get that maximum clean power. For this project, I do not regulate the DC supply going to the final power amplifier. Only the pre-amplifier stage op-amps get regulated DC. I think this is typical for guitar amplifier power stages. 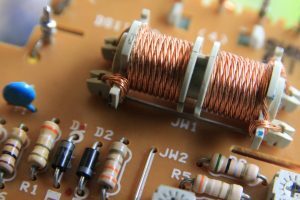 Unregulated DC on your PA rails offers a proven, reliable strategy, and of course, gives lower cost & complexity than when you put high power linear regulators on the power amp stage DC supply. 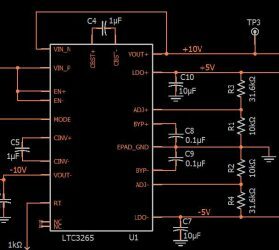 Unregulated, you won’t achieve the somewhat theoretical doubling of maximum amplifier power when going from an 8 to 4 Ω load, since the current draw doubles and this results in a greater voltage drop in the DC supply system. This also may occur because of AC signal factors: mainly increased PA transistor beta drop which I’ll discuss in Part 2. 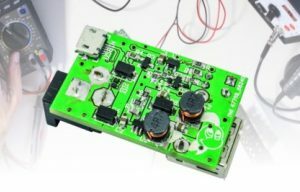 As aforementioned, you need to consider many factors when choosing what DC rail voltages you’ll need to get a certain clean signal amplifier power. When driving our PA stage, we suffer DC power losses from many factors. These include transformer winding resistance and leakage reactance, I squared R energy losses in your power supply system wires + any resistors including PA emitter degeneration resistors and so forth. 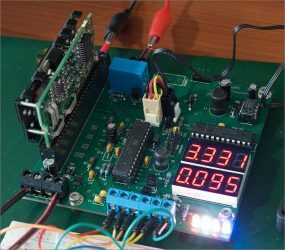 Above — A simple bench setup to measure AC + DC voltages on either of the DC supply rails. I’ll use this to measure my positive DC rail voltages — and later, peak-peak voltages [ AC ripple voltages ] on the positive rail. 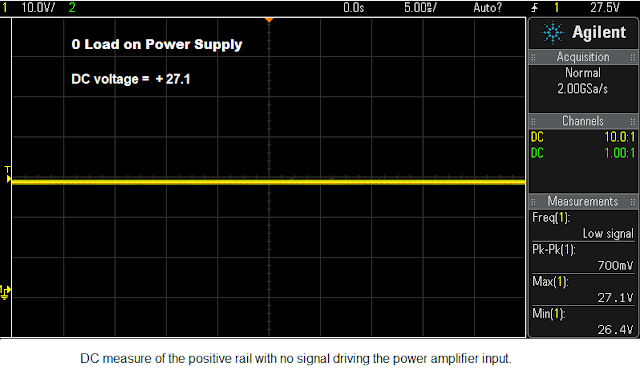 Above — DC measure of the positive rail of my power supply that’s connected as shown in Figure 1. The signal generator is switched off, or to 0 output. The unloaded positive rail measures + 27.1 VDC. 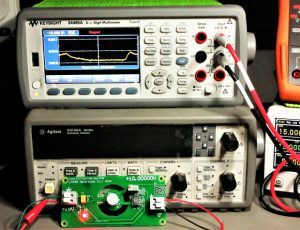 Above — DC measure of the power supply when connected to a PA driven to maximum clean signal power [ 23W ] by the 1 KHz signal generator. The unregulated positive rail has sagged to 23.1 VDC under this heavy load. We’ll use the above measure when we calculate % ripple in Section E. Reservoir Capacitors and Ripple. You can’t just casually order a transformer like you would some power resistors. Also, the cost may shock you; especially if you live in Canada. Making a power supply takes some thought & planning. 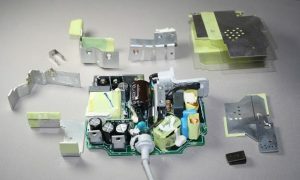 Think about your transformer’s VA, weight, mounting requirements, RMS AC output voltage, what maximum peak – peak signal voltage, you seek, plus other factors such as whether or not you plan to put the power supply right on the amp chassis, or sit it on the floor of a combo amp with patch wires connecting the power supply to DC power rails. As you go up in amplifier power rating & apply bigger transformers that provide a larger split DC voltage with more current, your build increases in difficulty. Heat sinking requirements, I squared R losses, the need for thermal protection/current limitation circuitry — and the potential for unwanted noises all go up. This is especially true if you wish to drive a 4 Ω load. 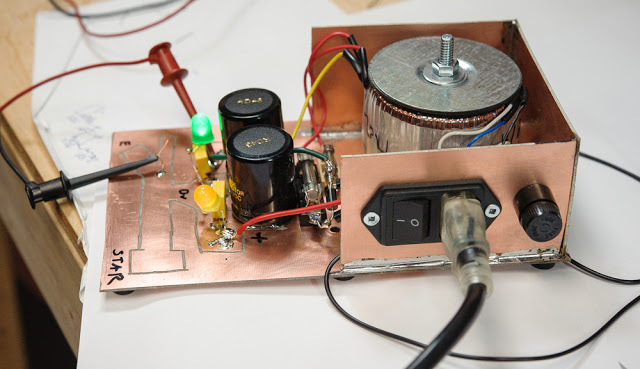 No one showed me how to make a solid state guitar amplifier, that’s why my blog needs to be taken with a grain of salt. Experts and critics may just lurk and smirk — however, I welcome constructive criticism from any readers who know more than I. We all learn that way. That’s why I chose a roughly 23W into 8 Ω clean guitar amp for my first build. Keeping the power down hopefully will allow us to enjoy success in order build confidence, plus gain the skills we might apply to future higher power amps if so desired. Above — Power supply schematic. For this project, I used the center-tapped Torel toroidal transformer that was listed as 50VA with + 18, 0, and -18 VAC RMS output. 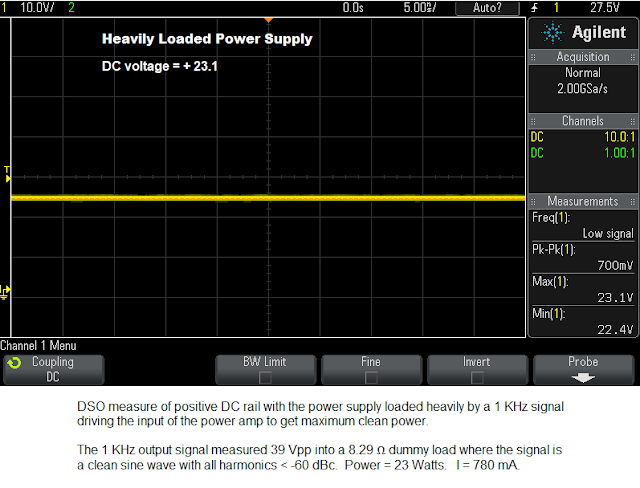 Mine measured 20 VAC peak — and rectified + filtered under load, I get a nominal +/- 25 VDC output. The panel mounted fuse is connected to the hot polarized AC Mains plug. 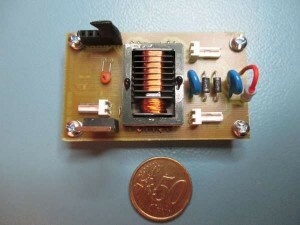 This power supply gets used in all experiments shown on this blog page. 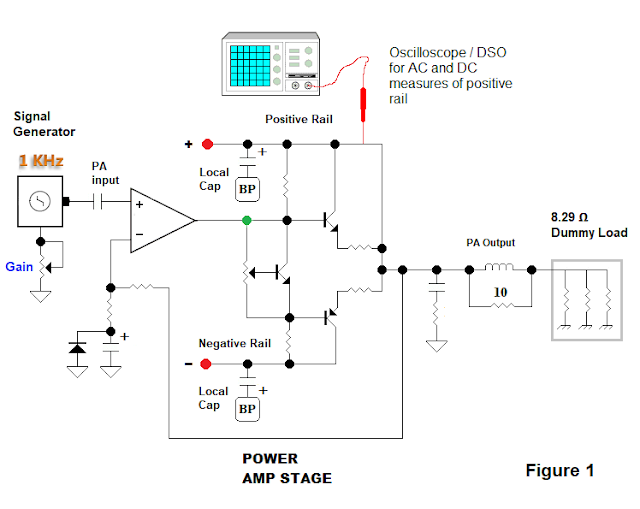 Above — Measuring the positive DC rail with no load on a DVM. I built my power supply enclosure from 2 – sided copper clad board. The lid is off for testing and photography. 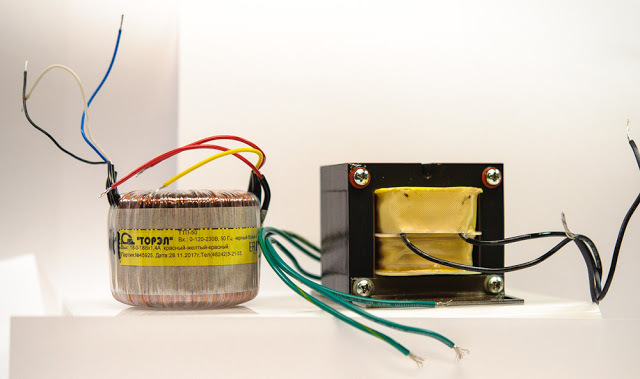 Although toroidal transformers leak less magnetic flux than conventional frame types, they still require electrostatic shielding to prevent capacitive coupling to nearby circuitry. Sometimes moving or rotating them may reduce their hum field. In general, keep you power supply away from your signal path circuitry; and especially your pre-amplifier. 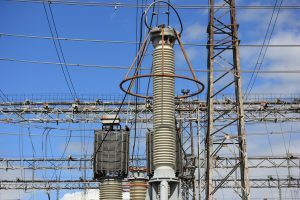 If you consider the wires that lead to and from the transformer, the rectifier diodes and the reservoir capacitors as a loop — the smaller the loop area, the better for EMI prevention. A loop potentially may inductively couple the transformer pulse currents into your nearby circuitry causing an annoying background AF buzzing noise that cannot be filtered off with bypass capacitors.